SZGS-0.1 Double-tapered Rotary Vacuum Dryer is suitable for concentration, mixing and drying of powder, granular and fibriform raw materials in chemical, pharmaceutical and foodstuff industries. SZGS-0.1 Double-tapered Rotary Vacuum Dryer is also suitable for the materials that need to be dried under low temperature, such as biochemical products. Especially, SZGS-0.1 Double-tapered Rotary Vacuum Dryer applies to the drying of the raw materials that are easily oxidized, volatile, heat-sensitive, irritant, toxic and not permitting to destroy its crystalline solid. 1. Heating source, such as water hot, low pressure steam or thermal oil, passes through the inclosed interlayer. The heat will be transmitted to raw materials by inner shell. 2. Under the driving of power, the tank rotates slowly and the raw materials inside are mixed continuously, which helps to realize the purpose of reinforced drying. 3. The raw mate rial is under vacuum. The drop of steam pressure makes the moisture(solvent)at the surface of raw material become saturation and will evaporate. The solvent will be discharged through vacuum pump and recovered in time. The inner moisture(solvent)of raw material will infiltrate, evaporate and discharge continuously. The three processes are carried out unceasingly and the purpose of drying can be realized within a short time. It is suitable for concentration, mixing and drying of powder, granular and fibriform raw materials in chemical, pharmaceutical and foodstuff industries. It is also suitable for the materials that need to be dried under low temperature, such as biochemical products. Especially, this machine applies to the drying of the raw materials that are easily oxidized, volatile, heat-sensitive, irritant, toxic and not permitting to destroy its crystalline solid. 1. When using oil for heating, the machine adopts automatic constant temperature control. It can dry biochemical products and raw mineral materials. Its temperature range is 20—160oC. 2. Compared with ordinal dryers, its heat efficiency is 2 times higher. 3. The machine adopts indicate heating, so that the raw materials won’t be polluted, in line with the requirements of GMP. It is easy to maintain, operate and clean the machine. Double-tapered Rotary Vacuum Dryer is suitable for concentration, mixing and drying of powder, granular and fibriform raw materials in chemical, pharmaceutical and foodstuff industries. Double-tapered Rotary Vacuum Dryer is also suitable for the materials that need to be dried under low temperature, such as biochemical products. 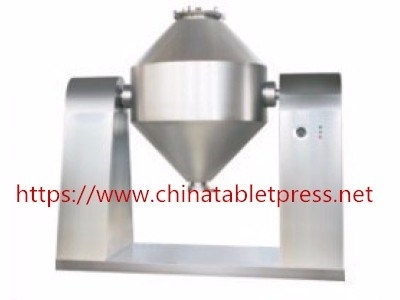 Especially, this machine applies to the drying of the raw materials that are easily oxidized, volatile, heat-sensitive, irritant, toxic and not permitting to destroy its crystalline solid.